Health claims on foods act as health messages and have a role in communicating and educating the consumer about diet-disease related issues. Previous studies have suggested that different formats of health claims communicate differently with the consumer. 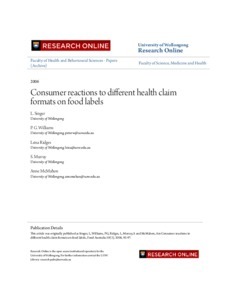 The aim of our study was to investigate whether splitting of the claim (a brief claim at the front package directing consumers to the back of the package where the full health claim is located) and/or endorsement of the claim (by Food Standards Australia New Zealand), have an impact on the acceptance of the claim by the consumer. Participants were recruited by a shopping mall intercept method in two areas of Wollongong and were interviewed face-to-face using a questionnaire. Split health claims were found, in some cases, to produce more positive responses than not-split claims in several areas: they created a higher level of satisfaction with the labelling, they produced a higher level of trust, and they communicated better the health risk on the claim. Endorsement of the claim did not appear to have an influence on participants’ response, possibly because of the small print of the approval statement or insufficient levels of awareness of FSANZ among consumers.